Our offered range of Channel Conduit Clamp are known for their durability and high performance. These are manufactured from high grade quality material. Our quality team is responsible for quality standard of our offered products. One piece clip guarantees a high permissible load. 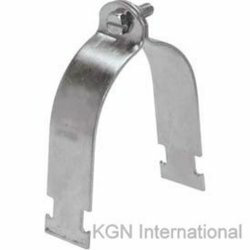 GSC Parallel Conduit SupportClamp is used for parallel mounting of conduits to the mounting surface. High grade malleable iron casting allows the product to bear heavy loads. It is easy to install and provides tight clamping for secure connection. High quality galvanization provides effective corrosion resistance. Available for conduit 1/2" to 1" EMT and 1/2" to 3/4" Rigid. We are a preeminent Bar Saddle Manufacturer, Exporter and Supplier from India. Manufactured and designed by experts, the Bar Saddle provided by us boasts of various features that make it an ideal Electrical Conduit Pipe Rtlings. Raw material used in the Bar Saddles is procured by us from reliable vendors and the finished product passes through several tests to check its flawlessness. We provide high efficacy Galvanised Spacer Bar Saddle manufactured from premium raw materials. Designed as per the highest quality standards, our range of Galvanised Spacer Bar Saddle is sure to provide excellent performance for the longer period of time. Galvanised Spacer Bar Saddle, offered by us, can be easily availed at competitive prices. In order to meet the various requirements of the customers, we are engaged in offering a wide assortment of Electrical Conduit Saddle. We are offering Channel Conduit Clamp to our client. 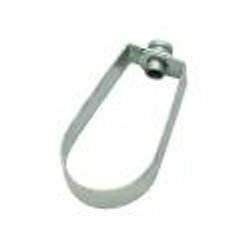 We are engaged in presenting an extensive range of Caddy Bolt Close Conduit Clamp to our clients. Moreover, clients can buy these clamps in bulk quantities at competitive prices.